Disclaimer: This is merely my experience with this lifestyle. Please consult a medical professional before beginning this or any kind of diet. If you are on social media or read blogs regularly, you have probably heard of the ketogenic diet. It has been around for decades, but it has quickly gained popularity in the last few years because, unlike other diets, you can eat lots and lots of fat! And it actually WORKS!! There has been an explosion of books, blogs, and even Pinterest recipes for the ketogenic diet. This is just going to be a short post on the basics of what the diet is in my own words and what my experience has been with it. 1. What exactly is the ketogenic diet? The ketogenic diet is basically a low carbohydrate, high fat diet. It is different from a low carb diet, in that it is an EXTREMELY low carb diet. After a certain amount of time of not eating carbs and sugar, which is different for everyone, your body will go into a metabolic state called ketosis. Your body will produce something called ketones. Since you are not eating carbs and sugar, your body needs something to use as energy, so the ketones your body produces will break down the fat on your body to use as energy, thus causing you to lose weight! You may be thinking….okay….no bread, pasta, potatoes, rice, fruit (yes, fruit! ), cakes, cookies….so what the heck is left to eat?? You may be surprised that there are a lot of things left to eat! This only works well if your diet consists of 75-80% fat, 15-20% protein, and the other 5% or so comes from the few carbs that are in cheese, some vegetables, and the occasional piece of dark chocolate. I try to keep my carb intake below 50g a day, which is what works best for me, but everyone is different. There is a great calculator found here that will tell you how much fat and protein to eat based on your gender, weight, and some other factors. Proteins: Beef (steak! Woohoo! ), chicken, turkey, shrimp, tuna, tilapia, salmon, lobster, crab, whole eggs, and pork (yes! Bacon!!) The fattier the better. Just make sure your meats are free of added sugars. I try to stay away from the packaged lunch meats. Try to stick to whole foods as much as you can. Fats: Extra-virgin olive oil, avocado oil, coconut oil, BUTTER, mayonnaise, heavy cream, sour cream, hard cheeses, soft cheese like cream cheese and bleu cheese, and avocados. Everything is the full-fat version. No low-fats here! Make sure not to use anything with hydrogenated oil in it, those are bad. Vegetables: Just think: Above ground okay, Below ground not okay. Things like potatoes, sweet potatoes, and carrots are a no-no. Yep, no french fries. BUT, there are SO many above ground vegetables that you CAN eat such as cauliflower, broccoli, spinach, lettuce, asparagus, zucchini, cucumber, cabbage, etc. Here is a sample menu of what I eat in a week’s time on the ketogenic diet. Note, that some days I only eat twice depending on my appetite, so I am adding three meals a day for those who are beginners. After a couple of months on keto, you may find that your appetite is not what it used to be. Your brain is no longer being tricked into being hungry by carbs and sugar! Lunch: Salad with pepperoni, cucumber, tomatoes, cheddar cheese, avocado, almonds, bleu cheese, ranch dressing. Lunch: Jimmy Johns Unwich (Basically a sub in a lettuce wrap). My favorite are the Italian ones. Breakfast: Breakfast bowl with turkey or chicken, bacon, two scrambled eggs, cheese, and avocado, coffee with heavy cream. Breakfast: Crustless quiche (Fill muffin cups with beaten egg mixed with bacon or sausage and veggies like onions, broccoli, or peppers. Lunch: Turkey and cheese lettuce wraps (basically a burrito using a big piece of lettuce, and roll up your ingredients). There are also a couple of books that really helped me understand the science of ketosis and what it does to your body, as well as what to eat and recipes to cook so that it doesn’t get boring. Maria Emmerich’s books are amazing. 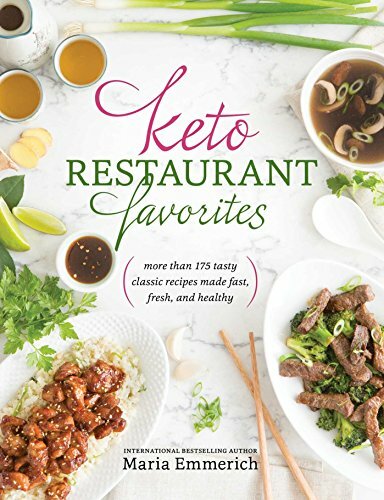 Not only is she the owner of the blog Keto Adapted as I mentioned above, she has some fantastic books on the ketogenic diet that I have used many times throughout my journey. The book pictured above is a very thorough guide to the ins and outs of this lifestyle. Everything you ever wanted to know, she answers in this book. This is probably my favorite of Maria’s keto cookbooks. 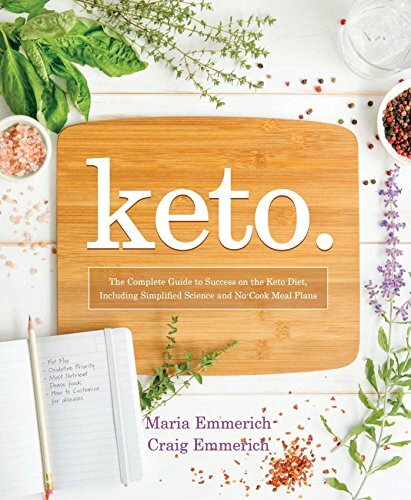 You will NEVER get bored on keto with this book. She takes your favorite restaurant foods and turns them keto-friendly. She conquers the different areas of cuisine like Chinese, Mexican, Italian, and American favorites too. This is one book that you don’t want to be without. My experience with keto has been very positive. I was able to lose 50 pounds and got down to a weight that I hadn’t been to in a very long time. No other diets were able to do that for me. I believe this diet is the most healthy for me, personally. I have more energy, I sleep better, and my outlook on life is much brighter. This is not just a diet for me, but a lifestyle. Thank you for reading this post and please comment below with questions or recommendations. Great post! I didn’t know to much about the diet before, so this was a cool read! I saw a movie on how this helps with seizures. It was a good movie. Some of this seems good but yeah gives me a good ideas to improve my diet. Yes, I believe this diet was first used in the 20s for epilepsy patients, and then they realized it was ideal for weight loss as well.